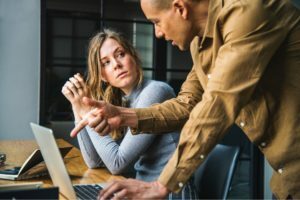 Over the years, the number one executive coaching topic was and is having a difficult conversation with someone in the organization. Frequently, the strategy for difficult conversations is to delay doing anything—hoping the situation will correct itself. Guess what? It doesn’t get better. In fact, it generally gets worse! Usually, fear of how the person will respond or feel ill-equipped as to how to go about the conversation leads to avoidance. Yet, leadership isn’t for the faint-of-heart. Maybe you are in the same position. I know I have been. I have had people cry, get mad and storm out of my office, blame someone else, and, occasionally, accept responsibility. As a young, emerging leader I learned a four-step process to deal with these situations. It was so helpful. Later, I developed a better process and put it in the context of coaching. I call it: Coaching for Performance Improvement. I have great luck with this process. Be sincere. Express your desire to see the individual be successful. Most often, the performance improved. When it doesn’t, you can spin off into progressive discipline or adverse action. Following the Coaching for Performance Improvement will lay a solid foundation for these other processes. 1. Describe the Performance Issue: Keep the focus of the individual’s behavior. Be specific. Cite examples. Ask them about it…and actively listen. 2. Explore the Impacts: How does this behavior impact the organization—its reputation or ability to serve clients? How does the behavior impact co-workers, the individual doing the behavior, or you as the manager who has to take time to deal with the situation? 3. Clarify Expectations: Ask the individual what they think is the right behavior? What should the behavior be? In other words, what is appropriate? Make sure there is clarity about expectations going forward. 4. Be Clear about Possible Consequences – Positive and Corrective: What happens if the individual corrects the behavior? What happens if the behavior isn’t corrected? The individual needs to understand the positive impacts of changing the behavior or corrective actions if it isn’t changed. 5. Engage in Action Planning: What options could the individual take to improve the behavior? Facilitate them brainstorming options? Add options that you see that they may have missed. 6. Commit to Action: Now that you’ve helped the individual do action planning, what steps will he/she embrace. When will he/she start? Seek specific dates and times. 7. Follow Up: Follow up is important. If you are like me, you’re probably very busy. I like to put the responsibility on the individual to report back with an update. Some questions to consider include: How will you know you have been successful? How will I know you have taken these steps? At what point can I expect you will provide me with an update? Record the dates on your calendar, as a back-up. If the individual fails to follow up as promised, include this in your next conversation with them. 8. Document: Depending on the situation, documentation may just be a note in the employee’s work file. When you have already had one or two conversations with the individual, it’s time to make it more real. Ask them to sign a documented counseling, acknowledging you had the conversation. Use these 8 steps as an outline. Seeing it in writing elevates the sense of importance. I encourage you to reach out to HR to see if their process is different and/or to get input from them in addressing the situation. You definitely want to keep HR involved in the process, if you have the option. Mary, I just overheard your conversation with that client. You were pleasant and professional. Have you ever considered the impact that such a positive interaction has on the client or a new employee who watched you? It is just the kind of interaction we love to see. I encourage you to keep up the excellent customer service. I know you are interested in promoting. It’s this kind of behavior that will help you reach your goals. Thank you, Mary! Notice that this brief conversation addresses behavior, impacts, expectations, and positive consequences. You might also document it and include a specific reference to it in the next performance review. For a more detailed explanation, visit our website to download a copy of Coaching for Coaching Improvement. This guide provides much more explanation, sample questions to ask, and includes a worksheet to help you prepare for a Coaching for Performance Improvement Conversation. Another resource is our YouTube videos. There are 10 short videos describing the process. You can view them by clicking on this link: Coaching for Performance Improvement. We are here as a resource for you. Let us know how we can help! Think about a time where you have received truth without grace or grace without truth. How did you feel and what did you do after the conversation? In contrary, think back to the stories of the bible when Jesus had difficult conversations with his disciples. How do you think the disciples felt? Moses gave us the law, but Jesus fulfilled the law through bringing grace and truth. In the corporate world, being a steward in difficult conversations is a balance of grace and truth.